I'd like to begin by apologizing for not posting anything last week. I'm sure you can relate that "busy-ness" (not necessarily "business") sometimes creeps up and gets the better of us, and I am no different. And now that that is out of the way, we'd like to share with you some of the events - or, more accurately, the things that God has done these past two weeks. With our Thanksgiving celebration coming up, which is free and open to all active duty military and spouses, we decided that we would go invite them personally. We went to our local navy base, Naval Air Station Oceana, and went to where all the single sailors hang out... or at least where we thought they were going to be - the base enlisted club... wouldn't you know it, it was closed for Veteran's Day! Not to be dissuaded, we headed over to the base bowling alley and voila - it was packed! We spoke to several people there, then headed over to the nearby barracks to catch anyone who might be hanging out outside. Our brother, Ramon, witnessing to two sailors in front of their barracks. All toll we prayed with 6 people and invited many more! We kept the press-on, inviting our local military families in from two of our local military housing locations. Another two souls were prayed with! We are hoping for an excellent turn out. What an opportunity to be a blessing, not only to our community, but to those who have already served us; our servicemen and women who've put themselves in harm's way to ensure our freedoms, and their families. "And from the days of John the Baptist until now the kingdom of heaven suffers violence, and the violent take it by force." The subject matter? Why, spiritual warfare, of course! 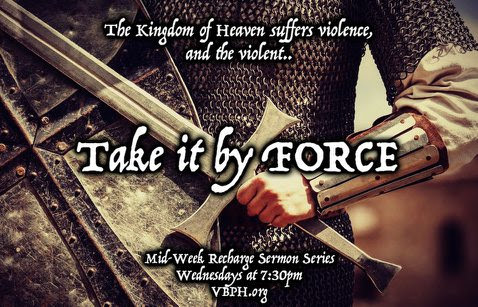 Please join us for this powerful series of messages. We sent ten me to a Men's Discipleship class in Jacksonville, NC. Filling an entire row, this is the most we've ever taken at one time. Pastor Mike Webb ministered a powerful message on the subject of longevity. It's been a while since we've done a Saturday Night Alive concert. 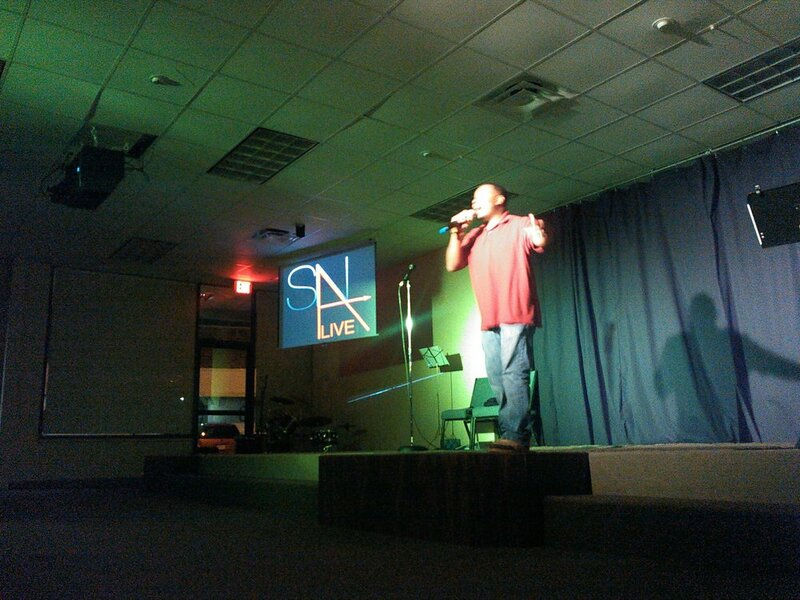 We were blessed to welcome our brother Rome from Newport News to bring us some of his unique brand of holy hip-hop. Our own Lil' Foot also performed as well as our drama team, Saturday Night Alive Productions (S.N.A.P.). We saw three visitors and had a wonderful time! Like I said earlier, we've been busy! With numerous events on the horizon, such as an upcoming Christmas Play, a Revival with Tony Chase in January, and our first ever Financial Peace University Class in February (coordinated by yours, truly), suffice it to say we'll be busy for some time to come. For now, the thing we'd like to bring to your attention is our upcoming Thanksgiving Day celebration. Free to all active duty and their families, our potluck-style dinner will feature all the traditional fixin's! Of course, we won't have all the exact same things they ate at the very first Thanksgiving, but you get the idea. That's all for now, folks. Until next time, we pray that you and yours would have a wonderful Thanksgiving, giving thanks and praise always to the almighty and everlasting God, whose magnificent gifts and abundant provisions, both physical and spiritual have left us immensely blessed. God bless you.